Two playoff teams. Both with their playoff fates determined. 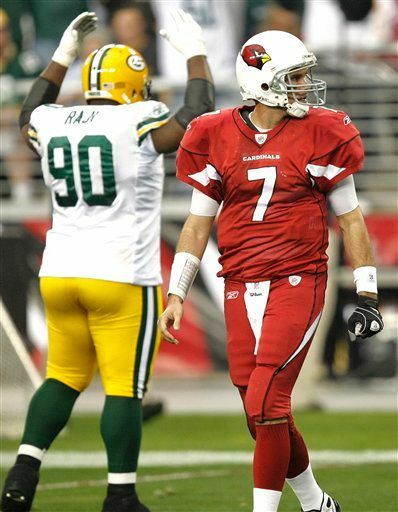 Interestingly enough, the Green Bay Packers, in their game Sunday agaisnt the Arizona Cardinals, opted to use most of their regulars while the Cards used their reserve players for the most part. The strategy on the Packers’ behalf worked very well as Aaron Rodgers played three efficient quarters, throwing and rushing for a touchdown as Green Bay embarrassed Arizona 33-7 at University of Phoenix Stadium. As previously mentioned, the Cardinals regulars saw limited action as Arizona sat quarterback Kurt Warner after one quarter and most of their first-team defense played only one possession, which showed throughout the game’s 60 minutes. Also, Packers coach Mike McCarthy didn’t change much in their offensive gameplan as the team torched the Cardinals for 345 total yards of offense. A 28-yard pass interference penalty against Michael Adams moved the ball to the Cardinals 1, where Ryan Grant scored for Green Bay. The next time the Packers had the ball, Adams was the defender on a 51-yard pass to Jordy Nelson, again to the 1. Rodgers sneaked over from there to make it 14-0 with 2:41 still left to play in the first quarter. After Steve Breaston unadvisedly fielded a punt at the Cardinals 2, guard Reggie Wells was called for holding in the end zone for a safety. The play negated another interception thrown by Matt Leinart, who had just entered the game. The Packers went 94 yards in 14 plays for their third touchdown, Rodgers throwing five yards to Finley for the score. 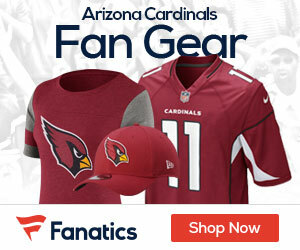 The Cardinals finally got on the scoreboard and avoided a home shutout when Brian St. Pierre, the third Cards quarterback used in the game, tossed a 3-yard TD pass to Larry Fitzgerald; the game was well out of reach prior to the Cards’ TD. Rodgers had a decent game, going 21-of-26 for 235 yards and a TD while rushing for a touchdown. Warner saw brief action, going 4-of-6 for 31 yards while Leinart went 13-of-21 for 96 yards with 2 interceptions; St. Pierre mopped up, going 2-of-4 for 12 yards with a TD and an INT. Grant led all Packers rushers with 51 yards on 11 carries and a score while Tim Hightower and Beanie Wells each had 6 rushes – Hightower for 24 yards while Wells had 19. Donald Driver led the Packers receivers with 6 receptions for 65 yards while Nelson caught a pass for 51 yards; Anquan Boldin led the Cards with 3 catches for 38 yards while Early Doucet caught 4 passes for 28 yards. Because of Minnesota’s win over the New York Giants, Arizona (10-6) got the #4 seed and will host Green Bay (the #5 seed) next weekend. I was rooting for McNabb to throw two more incompletions at the end of the Dallas game – which he did. As a result, Kurt (93.157) just barely passes Eli (93.120) and Donovan (92.875) to end up 10th in QB rating in the NFL. Hope my math is right. Way to go Kurt!